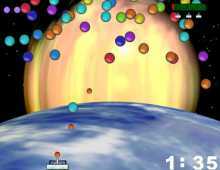 Not to be confused with a Macintosh puzzle game of the same name, Bubble Trouble is a cute little Missile Command clone, with attractive graphics, rocking soundtrack, and smooth gameplay. The objective is simple: make your way through 5 levels of increasing difficulty by shooting bubbles as they fall from the sky. You have 3 lives to start with; any bubble that gets past your cannon will cost you a life. Hold CTRL (shoot) key for a few seconds to create a big bubble shot that can hit several bubbles at once. There are difficulty levels, EASY and HARD, as well as a nice tutorial. Overall, a fun game that is strangely compelling-- another good Coffee Break Fun in our collection :) Not a top dog because it does get a bit tedious after a while, but it comes close. If you have 5-10 minutes of free time, try it out.